DR Congo. North is at top. 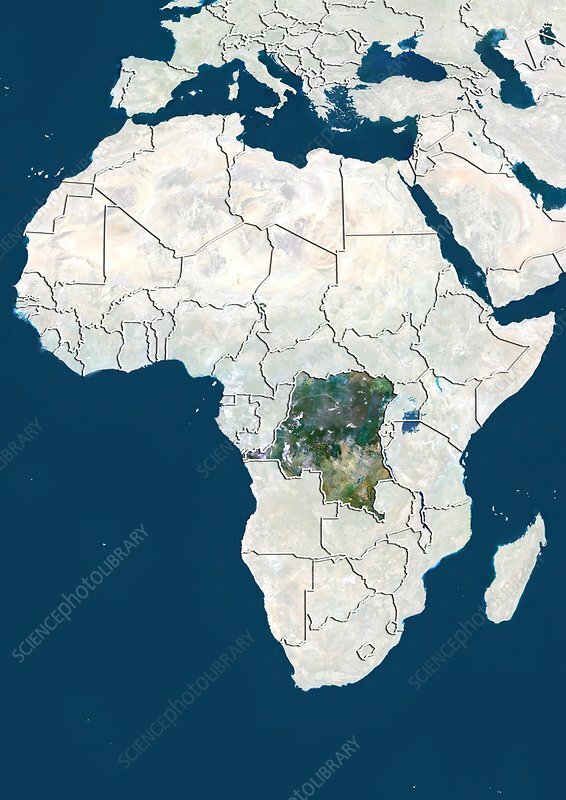 Satellite image of the Democratic Republic of the Congo (DRC) in Central Africa, with the surrounding countries shaded out. DRC borders the Central African Republic and South Sudan to the north; Uganda, Rwanda, and Burundi in the east; Zambia and Angola to the south; the Republic of the Congo, the Angolan exclave of Cabinda, and the Atlantic Ocean (blue, left) to the west. Europe (upper centre), the Mediterranean Sea (blue, upper centre), and the Indian Ocean (blue, right) can also be seen. Image compiled from data acquired by LANDSAT satellites, in 2012.